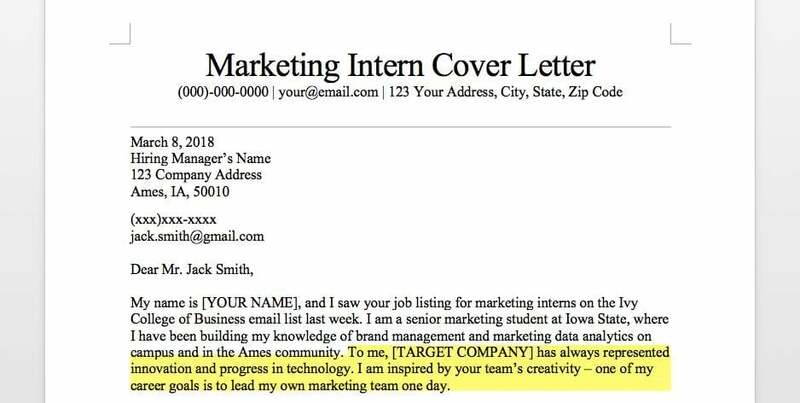 Starting your marketing intern cover letter may seem a little overwhelming, especially if you have no work history. How can you make yourself stand out from the other applicants? Fortunately, our guide will prepare you to make a unique cover letter and get the internship you’re eyeing up. Still unsure where to begin? Our thorough guide on composing well-written cover letters will walk you through the process. You’re on the way to a superb cover letter! If you would like to peruse through other fields, our free library of cover letter templates are at your disposal. My name is [YOUR NAME], and I saw your job listing for marketing interns on the Ivy College of Business email list last week. I am a senior marketing student at Iowa State, where I have been building my knowledge of brand management and marketing data analytics on campus and in the Ames community. To me, [TARGET COMPANY] has always represented innovation and progress in technology. I am inspired by your team’s creativity – one of my career goals is to lead my own marketing team one day. Last semester, I had the chance to lead a marketing campaign that encouraged prospective students to apply to Iowa State University. I surveyed over 4,000 high school students in the Ames area and started a social media campaign to spread the word of our campus visit days. My efforts resulted in a 19% increase in undergraduate applications at Iowa State. I demonstrated competence in social media and advanced skills in consumer behavior, so I believe I could make valuable contributions to [TARGET COMPANY]’s marketing department. In addition to my enrollment campaign project at school, I also spent time as a marketing trainee for Arctic Holidays. Last summer, I was a part of a marketing program that prepared me in social media marketing. At the end of the program, I was able to implement one of my ideas to conduct weekly recap presentations of customers’ trips, which led to over 1,000 new Facebook followers. I’ve noticed that [TARGET COMPANY] is looking to expand its marketing team and hire interns with familiarity in campaign management. My experience with creating social media strategies can help [TARGET COMPANY] develop further in this part of the market. I look forward to discussing the position further and how I can contribute to your team. I can be reached via email at [EMAIL] or by phone at [PHONE]. Thank you again for your time and consideration. I look forward hearing back from you. 1. Add a personal anecdote about why you’re interested in the company or marketing. Let’s be honest: hiring managers are looking at tons of cover letters every week, and many of them will sound exactly the same. Incorporating a story into yours is an effective way to differentiate yourself from other candidates. Instead of a retelling of your resume with the same cliche phrases, try making an introduction that explains why you’re passionate about marketing or excited about the prospect of joining the company. See below for examples of questions you can ask yourself before writing, complete with sample answers. These will assist you in making your introduction personable. The student in our cover letter example discusses why they’re passionate about the company in their opening paragraph. I initially had no idea which company I wanted to work for after graduating from Iowa State this semester. I could have gained the necessary skills and experience at anywhere, but I knew I wanted to get an internship at one that offered mentorship, opportunities for growth, and would allow me be creative in producing content. That company is Arctic Holidays. What made you love the company? When I was young, I would imagine going to Antarctica and plan out trips to see penguins, polar bears, and seals. A childhood dream became reality when I saw the job opening on your website. I’ve been impressed with Arctic Holidays’ dedication to providing the best tours to Antarctica, and now I would like to offer my knowledge in social media strategies to build its customer base. What are your key achievements or qualities? During my four years at Iowa State, I was known to take initiative in all my class group projects. I have always worked well with others, and I would love to bring my teamwork skills to the marketing intern position at Arctic Holidays. Want to add a humorous story in your introduction? First research the company thoroughly and decide if they would appreciate this style of writing; however, it’s best to avoid it altogether if you aren’t certain if it’s appropriate. 2. Research the company well, and use the information in your writing. Let’s look at the first thing you should research: the hiring manager’s name. You can ensure yours will be seen if you address it to an actual person and not just “Hiring Manager.” Use LinkedIn, Facebook, Twitter or the company website to find out who you will be in contact with about the position. Don’t forget to double check that you’ve spelled the contact’s name correctly. Small mistakes like this can get your application rejected immediately. Proper research of the company before writing the cover letter means you’re already one step ahead of candidates who didn’t. How does the company describe its culture? Will you enjoy this kind of culture? The sample answers all three questions. Do the same in yours, and you’ll impress the hiring manager that you took the time to properly research the company. 3. Show the results you’ve achieved in your projects. When you compose a marketing intern cover letter that details your work history, numbers and statistics are extremely helpful. But what if you don’t have quantified experience to show yet? That’s when you need to look back at your past projects or assignments. Like your resume, use any marketing campaigns, studies, research, etc. that you’ve done and what you achieved by doing them. 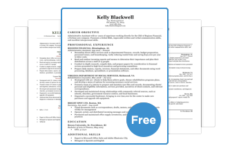 The cover letter is the perfect place to sell yourself and how you can bring similar results to next company. Our sample includes 3 different examples of results-oriented achievements. As mentioned in the first tip, you can open your letter with an achievement – but aim to put in 3-4 accomplishments in your cover letter. Bullet list format will work, too. But what if my accomplishments aren’t impressive? Well, there are ways to make them sound more appealing to hiring managers. Check out our example below. Less impressive: While at Iowa State, I took part in a business plan competition and my team received 2nd place. I was in charge of the marketing campaign. More impressive: While at Iowa State, I was a part of a business plan competition and received 2nd place out of 50 contestants. With a team of five classmates, we built a mock food delivery app startup company. I led the campaign using all marketing facets of a business plan, including consumer analysis and trends and brand management. After you’ve made the results examples heartier, your cover letter will be looking sharp and distinct from other candidates!